Our courses in Cancun and Playa del Carmen are carried out at shallow, crystal-clear water beaches, away from the interference of public, tourists, and other kiteboarders. 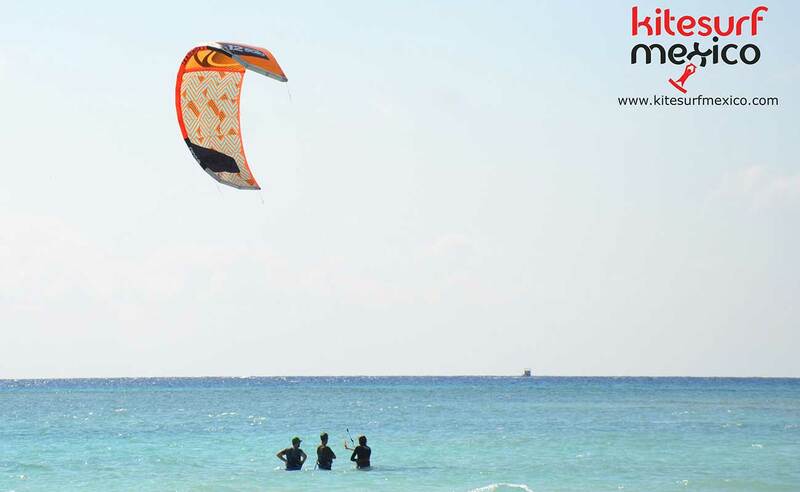 These beaches offer the most ideal safety conditions to learn kiteboarding under the supervision of our IKO certified professional instructors. We offer beginner, review and advanced courses. We have two types of courses for beginners: a full 3-day course and a basic 2-day course. We recommend you to take the full 3-day course, but for clients who don’t have enough days planned for their vacation, a 2-day course is also an option as a start in this sport. The courses are given in sessions of 3 hours daily, which can be done in the morning or the afternoon, depending on the availability and weather conditions. 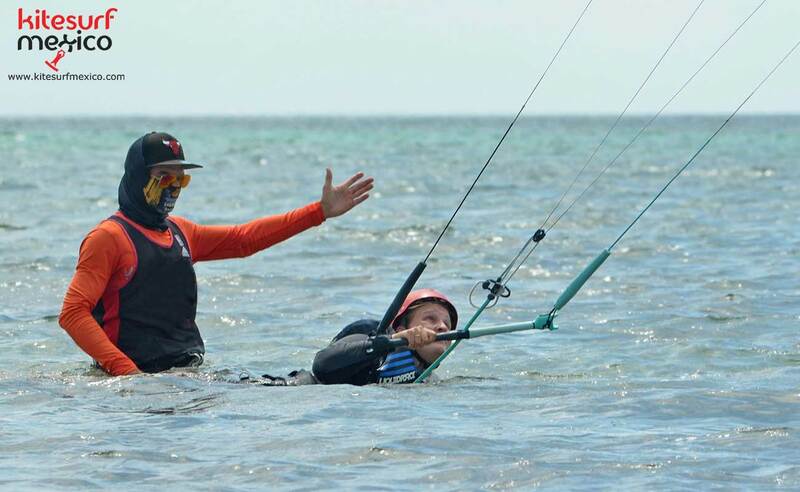 Both beginner courses start with an explanation on the wind, how to responsibly use the gear and the necessary safety measures for kiteboarding. Then we go to shallow waters using a small, short-line kite to learn to control the kite by performing different exercises. This is done while the student is standing with the water up to his waist (see images), always in the company of an instructor. Once the student -still standing- gains control of the kite in all the extension of the wind window, he starts learning to control the kite with his body in motion, to then start making movements with the kite in power on the water (Body Drag). 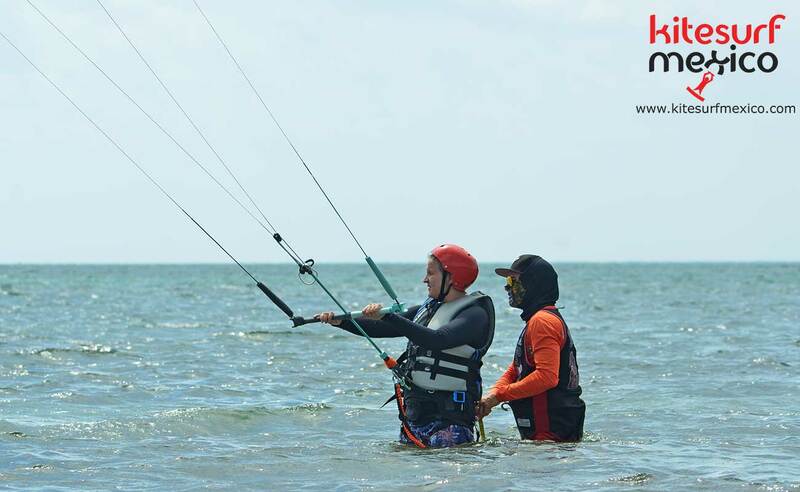 Body dragging consists on letting the power of the kite drag your weight on the water in the desired direction, which has already been achieved due to the kite control obtained in the previous stage. Once the student has learned all these previous steps, he will now learn to stand on the board using the kite power. This is called “water start”. This is how the student will start making his first advancing meters on the board. From this point, the full course focuses on achieving the right position on the board and learning to ride in the desired direction. This option is the most chosen by new students, since it allows for a greater level of autonomy at the end of the course. We also offer review courses for clients who have already taken some classes but still are not independent. Likewise, we recommend a review for those students who have spent more than a year since they last took the course. 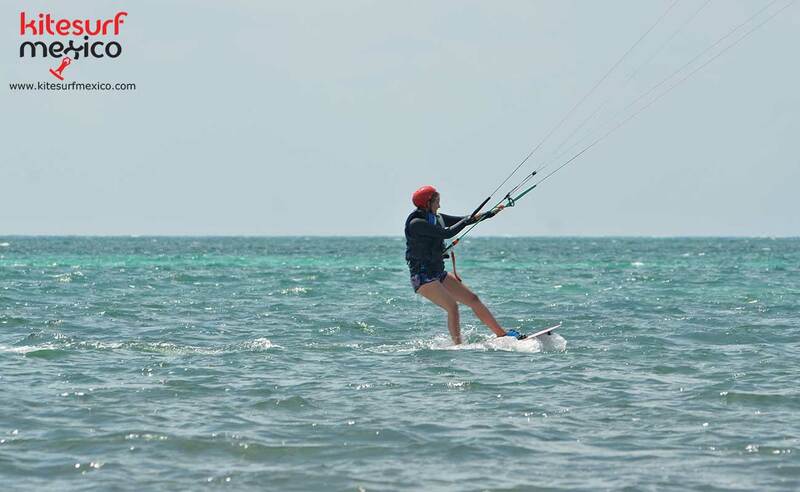 These classes are customized to meet the clients’ needs to continue learning from the point where they left or to reinforce knowledge and/ or learn what’s needed to become an independent kiteboarder. The advanced courses are designed for kiteboarders who seek to progress by improving their level or by learning any specific tricks.